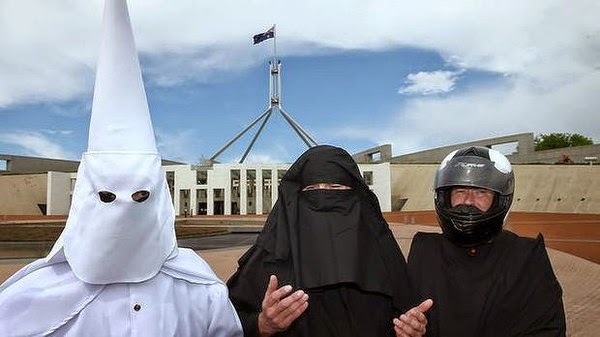 In an anti-Niqab protest, three Australian men - Sergio Redegalli, Nick Folkes and Victor Waterson - donned a Ku Klux Klan (KKK) white robe and hood, a black niqab, and a motorcycle helmet and trekked on over to the parliament building to prove a point. And as expected, upon arrival, they were told that they could not enter wearing the KKK hood or motorcycle helmet. 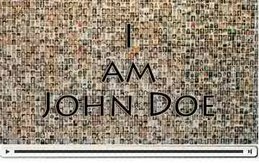 The men are involved in a movement called "Faceless" - they want the Muslim burqa and niqab (which covers all but the eyes) to be banned nation-wide, in public, and called the decision to allow Muslim face-coverings but not helmets or KKK hoods hypocritical. “It seems that you're allowed to wear a full-face covering into Parliament if you're a Muslim woman, but no other group is allowed to have that same privilege,” Redegalli said. “We, as males, are not allowed to wear any face coverings in Parliament House." Niqab and Burqa-clad women are allowed entrance into the Parliament House as long as they show their faces at the security checkpoint. A bill to force women wearing a niqab to sit in a special area, was reversed after it was deemed discriminatory.